"This is a pie that tastes like a giant soft chocolate chip cookie." In a large bowl, mix together eggs, flour, sugar, vanilla, and melted butter. Mix well. Stir in walnuts and chocolate chips. Pour into pie shell. Bake for I hour. This recipe is great, but the thing is, this recipe is originally from Kentucky. It is called Derby Pie, and has always been from the Ky. Derby. This is my absolute favorite pie. It is a Thanksgiving classic at my house. I've been making this for decades! Always a winner, exactly as written! Wonderful with gobs and gobs of unsweetened whipped cream to cut the sweetness. Amazing served warm! We really enjoyed this pie. I served it with vanilla bean ice cream. This was very good. 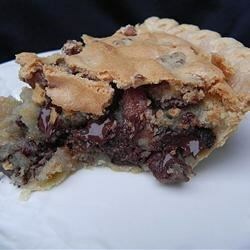 tasted like chocolate chip pie.